That looks fantastic! I have never seen that out east, but I love the idea. That sounds like dessert for breakfast (could be IHOP). It sounds delicious. I've never seen it or even heard of it before this. Come on, don't tease us! Recipe? Yes, I think it would very good with pancakes too. My wife usually does not measure when she cooks, so these are just guesses on quantities of ingredients. You will be able to tell how much milk to add to make it as thick as you like. Same with sugar to make it as sweet as you like. We like it about the consistency of a semi-thick white gravy. It's really easy to make and only takes about 5 minutes. You can adjust your ingredients to the amount you want to make. If you make a bigger batch you can refrigerate it and eat over the next day or two. 1.Add about 1/3 cup butter to saucepan and melt over medium heat. 2.Once that's melted and starts to bubble, add in about 1/3 cup flour and mix together. Keep slowly adding enough flour to make a thick paste. 3.Then add in, very slowly, about 1 to 1-1/2 cups milk. Add in about 1/8 cup or less at a time and keep mixing to avoid your cream getting lumpy, until it is the consistency you want. 5.Add in about 1/8 cup or so of sugar. Add a little and taste it. Add more if needed. We like ours pretty sweet. 6.Then add about a tablespoon of vanilla. The toast looks healthy, but the sweet cream gravy looks out of this world. In my neck of the woods, we’d throw some sausage in that gravy and put the gravy on top of the toast (or biscuit). 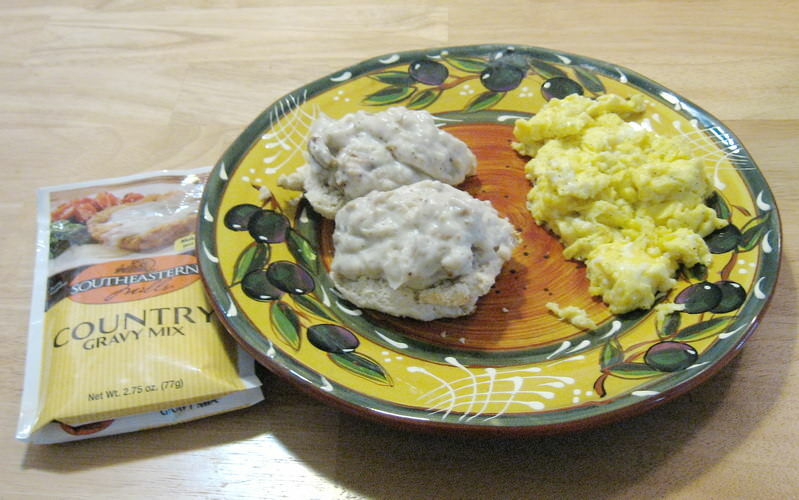 (09-15-2018, 12:35 PM)churchilllafemme Wrote: This morning we had scrambled eggs and Bisquick biscuits with Southeastern Mills Country Gravy and added sausage. Very little cooking from scratch in this household.